Reality kicked in again on Saturday for MK Dons, and it came in embarrassing fashion at the DW Stadium. When they needed, if nothing else, a spirited performance, they turned in a dull and lifeless one. The humiliating 5-1 defeat at Wigan was a shadow of the second half display against Blackburn Rovers - another side in the fight for the League 1 crown. Few predicted any points from the last two games, but after something of a turnaround in fortunes for Dan Micciche's side, one 45 minute spell in 180 minutes of football was all there was to shout about. The landscape isn't as pretty a picture as it was a week ago. Will Grigg had the free reign of the MK Dons penalty area, and but for Ethan Ebanks-Landell's header into his own net, could have ended the day with four to his name rather than just three. Nick Powell was excellent, Gavin Massey similarly so. The difference between the sides looked as vast as the table suggests, and realistically they were divisions apart. It was a display, not to mention a result worth being embarrassed over and the pain of it should be remembered, not brushed aside. Micciche and his squad must dwell on the result, and strive not to let it happen again. The pain of relegation will hurt considerably more. 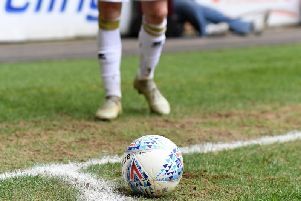 Having picked up 10 points from 12 prior to the visit of Blackburn on Easter Monday, it looked like fortunes were on an upward spiral again at Stadium MK. But after showing too much respect to Blackburn in their 2-1 defeat, their 'rabbit in the headlights' showing at the DW Stadium appears Dons have taken a step back to where they were before their win over Rotherham a month ago. Their worst league defeat this season, losing at Wigan fortunately for Dons made little difference to the League 1 landscape. They remain a point from safety after late goals for Scunthorpe and Portsmouth against AFC Wimbledon and Rochdale respectively. But with only five games to go, the mountain they need to climb in order to escape the bottom four is that bit taller.